You may have heard people talk about stripping cloth diapers. Build-ups can occur in your diapers over time that affect their absorbency - and the way they smell! Don't worry, it's not nearly as bad as it sounds! This article talks about urine and detergent residues, what causes them, and what you can do to fix them! 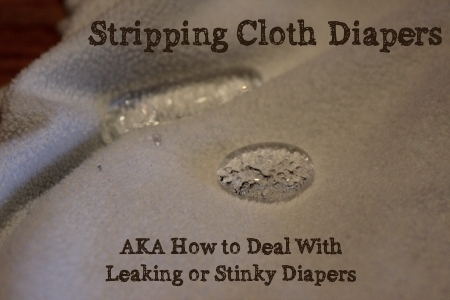 Stripping Cloth Diapers - Why? Clean diapers should not smell. If they are stinky, you may have a detergent residue, or a urine residue if you are not using enough water. By stripping cloth diapers, both issues can be solved. Hang in there and we'll help you get back to a peaceful coexistence with your cloth diapers! Detergent residue occurs when laundry detergent builds up or coats your fabric. This residue reduces the absorbency of your diapers, which may cause them to leak or to wick moisture into your baby's clothing or bedding. It usually takes a few months for detergents to build up in your diapers and cause problems. Using dryer sheets, even with your other laundry. Read more about the problems dryer sheets can cause with diapers in our article about wool dryer balls. 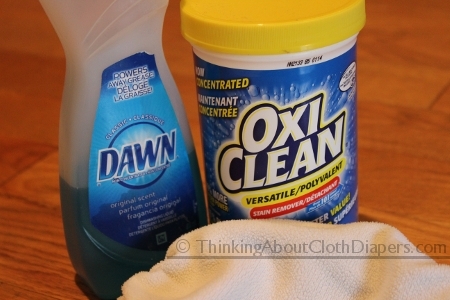 How can I Avoid Detergent Residue? Once you establish a basic laundry routine and select the right cloth diaper detergent, often you won't experience any troubles with your cloth diapers. 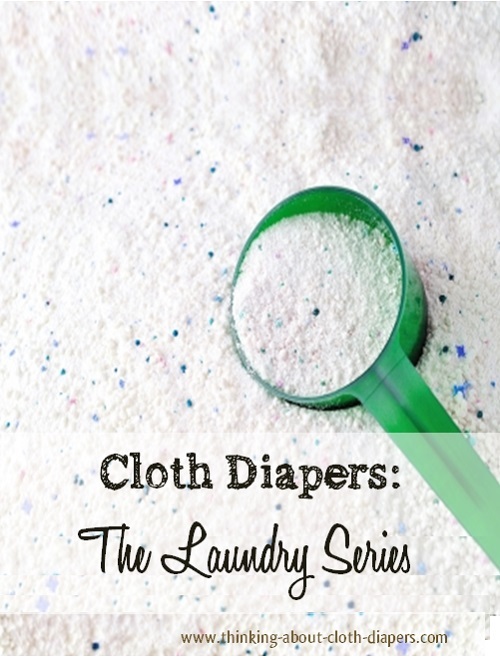 Read Washing Cloth Diapers for help getting started with cloth diaper laundry. Make sure you're using lots of water to rinse the detergent out of your diapers. Be sure to pick a cloth diaper-friendly detergent. 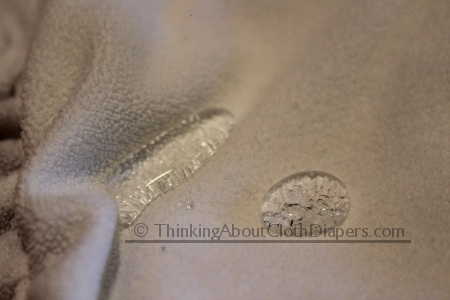 For more about cloth diaper detergents, read our article here. Removing detergent residues is sometimes called stripping cloth diapers. If you think your cloth diapers have a detergent residue issue, you can strip them by doing a half dozen washes with hot water and no detergent, and then drying them your clothes dryer. Use as much water as you can by adjusting your machine to the highest water level setting you can. If your machine doesn't have a water level setting (i.e., most front load machines!) you can add wet towels to your laundry load to increase the weight of the load so your machine adds more water. If you need to remove diaper rash cream from your cloth diapers, you may want to try hand-scrubbing them with blue Dawn (Original formula without any grease fighters!) or original Sunlight dish detergent. It's important you avoid dish detergents with additives or enzymes as they may cause more problems than you had before! Both blue Dawn and Sunlight Original dish detergents are very good at releasing oils and grease and can be used for hand stripping. Be careful not to use too much detergent, and be sure to rinse your diapers well before you add them to your washing machine. These soaps will create a lot of suds, which can damage your machines, so you shouldn't use them as part of your every day cloth diaper laundry routine. With new high efficiency washing machines, it can be difficult to get your washing machine to add enough water to get them completely clean. Urine residues may also be caused if you don't use enough detergent. If the urine is not rinsed away, it will create a residue in the fabric. Cloth diapers with urine residue will smell like ammonia when your baby pees in them. Cloth diapers with urine residues can cause diaper rashes, because babies' skin is sensitive to ammonia. How Can I Avoid Urine Residues? Use the correct amount (and type!) of detergent - follow your detergent manufacturer's recommendations for how much detergent to add. If you're still having trouble, you may need to switch to another detergent. If you switch to a new detergent, it can be best to run a couple of extra wash cycles. Sometimes detergents will "release" residues from the previous detergent, causing irritation to your baby as the two detergents react. An extra wash or two can provide more peace of mind! If your diapers have a urine residue, the easiest way to fix them is to run several hot water washes with as much water as you can add to the machine. Soaking your diapers can also be helpful. If your diaper manufacturer allows it in their warranty conditions, a scoop of Oxyclean in your regular wash cycle can also help you get a deep clean on your diapers. Lots of companies sell products geared toward stripping cloth diapers. We have had urine residue and never had to buy a special product, but it might make the experience of cleaning them faster and easier for you! If you have any products you really recommend, please let me know or leave a comment below. Laundry is one of the biggest worries for parents that are new to cloth diapers. Urine and detergent residues are bound to happen to everyone, but they don't have to be the end of your cloth diaper experience. Once you understand why cloth diapers need to be stripped, it can be much easier to deal with them. If you have any questions or troubles, please feel free to contact me and I'll try my best to help!